Like so many IT departments, Derek Moore’s lean staff is tasked with supporting a heterogeneous device environment that enables seamless connectivity, throughout indoor and outdoor spaces, for thousands of devices. Yet his organization’s legacy wireless system was struggling to keep up. Ranked among the top U.S. public school districts, 12,500-student PAUSD sought a high-performance Wi-Fi solution with streamlined management. “Consequently, our network infrastructure must address the resulting technology needs and operate with minimal overhead to steward taxpayer funds while ensuring our IT staff can concentrate on providing critical applications and services,” he adds. After evaluating options with the help of trusted local partner Dasher Technologies, PAUSD selected a comprehensive Gigabit Wi-Fi solution from Aruba, a Hewlett Packard Enterprise company. PAUSD’s new speedy and secure Wi-Fi enables teachers and learners to collaborate anywhere on campus while also delivering management efficiencies. According to Moore, Aruba’s latest operating system and its Mobility Master capabilities solve PAUSD’s most intractable management challenge. Adopting Aruba not only enabled unifying all of PAUSD’s sites onto a single network, but also leveraging the hierarchical, multi-tiered architecture in ArubaOS 8 for simplifying and streamlining the network configuration process and minimizing repetition. PAUSD also appreciates ArubaOS 8’s Live Upgrade capability, for in-service updates, and innovations in AirGroup for controlling shared devices such as printers and digital media players. Augmenting ArubaOS 8 for unifying network management are ClearPass, for access control, and AirWave for network optimization. They provide unparalleled visibility and control of PAUSD’s network for district-issued, BYOD and Internet of Things (IoT) devices. Most importantly, PAUSD’s new WLAN powers modern curriculum models as well as supporting new device policies and trends. 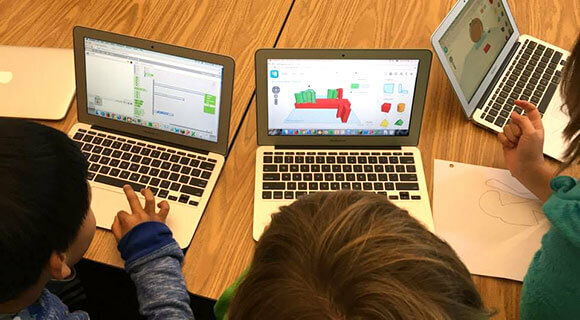 At the elementary and middle schools, PAUSD uses a cart-based model for classroom computing. “We have a mixture of Apple laptops, Chromebooks and iPads, depending upon teacher preferences,” says Moore. Teachers rely heavily on Wi-Fi for infusing student engagement into their curriculum, Moore says. In addition, secondary school teachers are required to utilize PAUSD’s Schoology learning management platform daily, further contributing to wireless traffic. What’s most notable to teachers and learners is the vastly improved user experience, evidenced by the sudden drop in complaints after Aruba Wi-Fi went live. With classroom needs met, the next frontier at PAUSD is streamlining IoT connections requested by various departments, notably maintenance services. To speed onboarding, while reducing IT overhead, PAUSD is exploring the capabilities in ClearPass for extending IoT onboarding self-service to maintenance staff and others deploying IoT units. Overall, PAUSD’s new WLAN enables the district to meet the ongoing needs of today and tomorrow.